Posted on Fri, Feb 3, 2012 : 2:27 p.m. The Hockey Commissioner's Association announced Friday that Michigan goaltender Shawn Hunwick is its national player of the month. 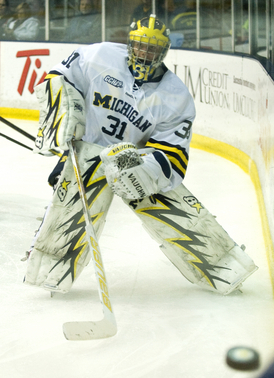 Michigan goaltender Shawn Hunwick, above, was named the Hockey Commissioner's Association player of the month. It's the second award in as many days for Hunwick, a fifth-year senior, who was announced as the CCHA goaltender of the month on Thursday. Coincidently, Hunwick played fewer games in the month of January than any previous month this season as he left a victory against Lake Superior State in the third period on Jan. 6 and didn't play the next night. The Wolverines did not play last weekend. When Hunwick was in, he was on fire, posting a 4-1-0 record with one shutout, a 1.08 goals-against average and a .971 save percentage. He posted victories in his first three appearances, allowing just two goals total over that span. The 5-foot-7, 166-pound goaltender made a career-high 46 saves, for his third shutout of the season, on Jan. 13 at Ohio State before leading Michigan to a 4-1 against the Buckeyes at the Frozen Diamond Faceoff on Jan. 15. Hunwick is tied for seventh in country in shutouts (three), ranks ninth in save percentage (.928) and is 12th in goals-against average (2.17). The Sterling Heights native was named the CCHA Goaltender of the Week for the week ending Jan. 16.